If you’re still fighting the battle for best-dressed man in the room this season, then deliver a knockout blow by pulling on a shorts suit. While we’re not great believers in cropped tailoring at the office or your average upscale wedding, there’s definitely a time and a place for baring your legs while wearing a blazer – a rooftop cocktail party, perhaps? But before you pull on a shorts suit, there are rules to consider. Take a look at our guide to gutsy summer smartwear, below. There’s nothing worse than witnessing a guy who’s tried a bit too hard to smarten up a shorts suit. You’re not Pharrell, and whatever swanky do you’re heading to this summer isn’t the Oscars, so just be cool and wear yours with a plain crew neck T-shirt or white linen shirt layered underneath. Remember, if you are heading somewhere that stipulates formal attire, there’s no substitute for an actual suit. Sure, these lopped off versions make a killer alternative to wearing, say, lightweight chinos and a sports jacket, but they should never be considered a straight swap for the real deal – even in summer. You’re already playing a risky game by throwing short tailoring into your seasonal wardrobe. So to ensure your silhouette and proportions don’t get completely thrown off by baring your legs at the same time as layering up with a blazer, make sure everything fits perfectly. Opt for slim cuts that sit close against the body for a slick, refined look or, alternatively, go for a shorts suit in something like a deconstructed linen or seersucker for a more relaxed, laid-back take on the trend. 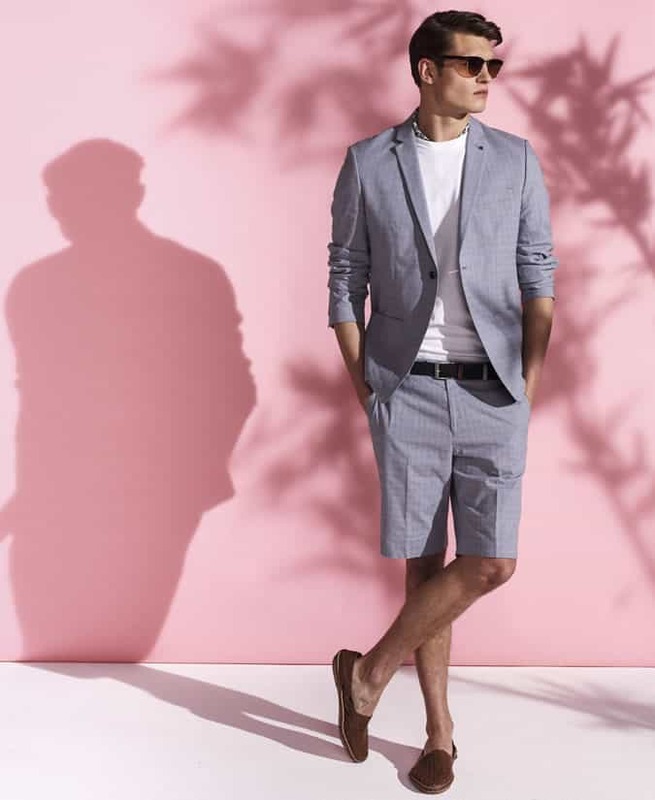 If you decide to give this whole shorts suit thing a whirl, the beauty is that you can mix and match your blazer with whatever tailored shorts you like, within reason. Clashing different colours, patterns and fabrics are just a few of the ways to display one’s sartorial flair, but this can go wrong quickly. Instead of too much risk-taking, try mixing tonal blue pieces together – navy cotton shorts with a light blue linen jacket, for example – for a foolproof combination that any man can pull off. As already discussed, this is not like a normal suit, so don’t treat it like one. Adding too many bells and whistles, such as ties, lapel pins and pocket squares – which look terrific on a full suit – can come across needlessly fussy and ostentatious on a short version. Never has the ‘less is more’ mantra been truer, because adding too many extraneous accessories will serve to cheapen your aesthetic and suggest you’re trying to compensate for the lack of fabric. Regardless of what footwear you pull on with your shorts suit, leave socks out of the equation – unless, of course, they’re little invisible ones. If you’re going for a smart-casual vibe, keep the suit looking modern and relaxed by adding a pair of crisp all-white trainers into the mix. Alternatively, for a slightly smarter aesthetic, try a pair of suede Derby shoes or loafers, which will lend your outfit a reassuringly expensive, fashion-forward feel. How To Wear A Belt With A Suit Tailoring sin or underused menswear hack? Cocktail Attire: What It Means & How To Dress For It Dress codes don't get more fun than this The Best Spring Jackets For Men How many do you have?